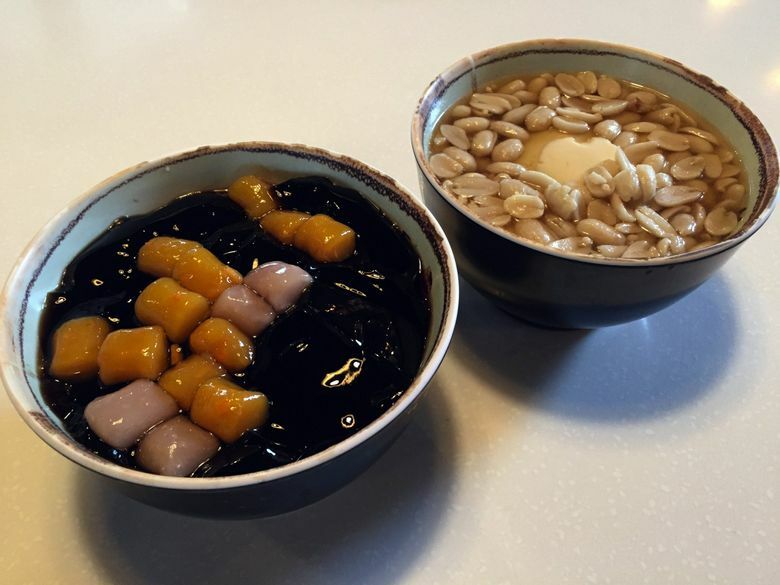 When I first saw photos on Facebook of Taiwanese desserts from a relatively new place in Bellevue called Meet Fresh, I was hit by a strong wave of nostalgia. Here were photos of fluffy mounds of shaved ice, decked out with peanuts, melon jelly, little mochi balls; bowls of sweet red bean soup with rice balls — familiar images from, well, if not my childhood, then youthhood. I had spent a summer, years ago, visiting relatives in Taiwan, and also, later, a year studying there. And among my favorite memories: the shaved ice, their glacial creamy-yet-light sweetness soothing during those hot, humid days. I’ve since tried various Taiwan-style shaved ices in Seattle, with varying degrees of satisfaction. Some were simply too, well, icy, with not nearly enough creamy condensed milk mixed in. Others were too sweet or had ingredients that were not so fresh. All left me searching for the perfect shaved ice of my memories. So when the opportunity came to visit Meet Fresh, I jumped and grabbed my cousin (also a fan of Taiwan-style shaved ice) to come with. 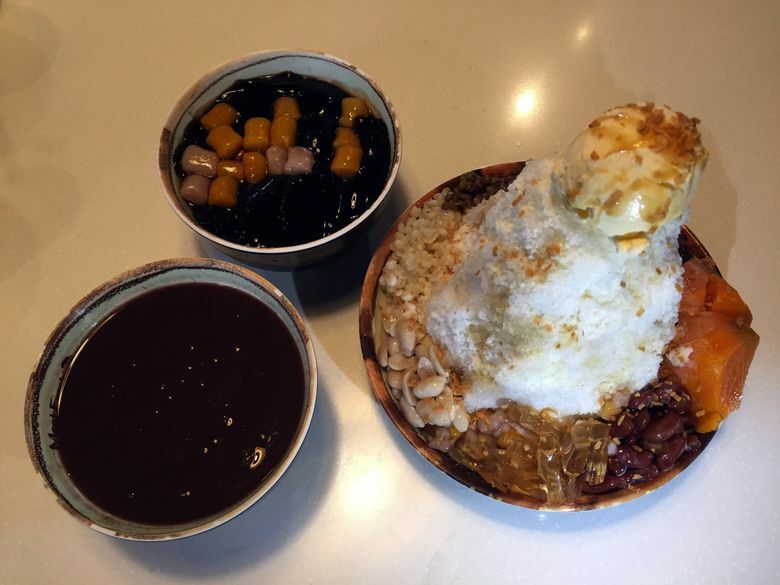 This location of Taiwan-based dessert chain Meet Fresh, in Lake Hills Village in Bellevue, was opened late last year by Elaine Song, owner of dumpling joint Jiaozi! in the Chinatown International District, which closed last year when its lease expired. At Meet Fresh, the space feels a bit like a friendly college cafeteria, with lots of blond wood, white-topped tables and square stools. Take your place in line, and snag a menu from the checkout counter to look at the pictures of the many dessert offerings, from toppings-laden shaved ices to bowls of warm tofu pudding and red bean soup. My cousin and I got the Signature Icy Grass Jelly, 8 Treasures Shaved Ice, Hot Taro Ball #5 and Peanut Tofu Pudding. We first tried the Signature Icy Grass Jelly ($8.25) — a bowl full of black jelly with pillowy little puffs of taro balls (which, to me, essentially looked and tasted like mochi), on a bed of shaved ice. I wish the grass jelly (a Chinese herbal jelly) would have had a stronger herbal taste, and neither my cousin nor I thought the ice added much to the experience. But the texture of the dish was delightful, with the soft and slightly chewy purple and orange taro balls contrasting with the silky, slippery grass jelly. 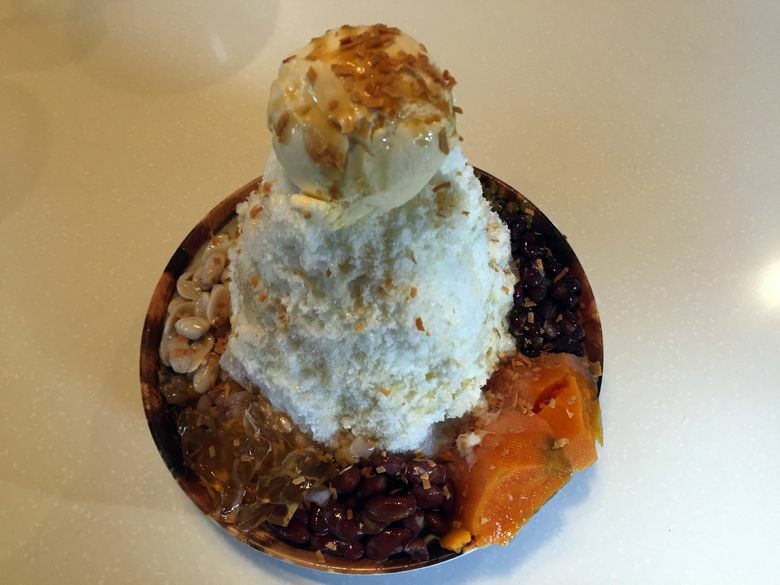 The 8 Treasures Shaved Ice ($12.50) came, looking like a conical snowman — a round “head” of vanilla ice cream atop a tall mound of shaved ice. Surrounding it all, at the bottom of the bowl, were the 8 “treasures”: peanuts, barley, mung beans, red beans, mini taro balls, sweet potato, kidney beans and yellow melon jelly. The presentation looked impressive. But eating it proved challenging as we tried to scoop the shaved ice without toppling the whole thing over. “It feels like you’re playing a game of Jenga,” my cousin said. The beans were cooked just right — not underdone but not mushy either — and the textures of all the toppings blended well with the shaved ice and each other. But both of us wished for more creaminess (more condensed milk, perhaps) mixed in with the shaved ice, while the vanilla-ice-cream flavor and texture overpowered the more delicate flavors of the other toppings. We moved on to Hot Taro Ball #5 ($8.25), in which orange and white mini taro balls, boba (chewy little tapioca pearls), and kidney beans dotted a warm sweet red bean soup. “It’s really fun to eat,” my cousin said of the combination of those different textures. I, meanwhile, enjoyed most the taste and texture of the red beans. My favorite dessert was the relatively simple Peanut Tofu Pudding ($6.80). The light, silky tofu had that subtle nutty soybean taste to it that good, fresh tofu has, while the peanuts were cooked to a perfect texture — softened but still with some bite to it. While the light syrup was just a tad too sweet for my taste, it wasn’t overly so. Total youthhood comfort in a bowl. Song, the owner of Meet Fresh, says she “always wanted to open a dessert and milk tea [shop]. I love dessert and milk tea.” She had also been looking to offer desserts that were healthier than most sweets shops, with offerings that are less sweet than most American ones, and that use ingredients, such as beans (the ones she uses are organic, Song says) that are healthier. She’s opening another location of Meet Fresh in June in Southcenter Mall. And fear not, fans of her dumpling shop, Jiaozi! Song says she’s on track to reopen Jiaozi!, this time in Bellevue’s Asian Family Market, probably by late summer.